Cree LED Lighting LED lamp features screw-in E26 bulb base. 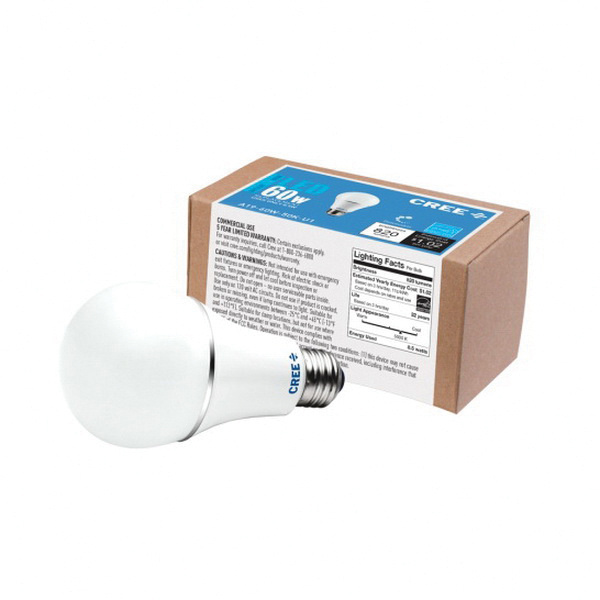 This 10.2-Watt, A19 bulb outputs 1150-Lumens of bright and crisp light. This omni-directional lamp features an average life of 35000 Hours. The dimmable lamp produces daylight colored light with 5000K color temperature and 85 CRI. This arbitrary shaped lamp is suitable for use in damp locations. The 120-Volt AC lamp consumes up to 88% less energy than incandescent bulbs and suits most of the incandescent dimmers. The LED lamp meets cULus, ANSI, FCC Part 15, Subpart B, Class B and RoHS standards.